Take up work at the Jackpot Factory and you will be working the line to create plenty of moolah! Click here to play! As you head to work, you’ll want to watch out for the Jackpot Factory logo. This sign is a wild symbol and will replace most other symbols to help you bring in even more wins. It will also payout up to 4000 times your line bet if you can spin two to five of them across an active payline. There are plenty of workers in this factory that will help you create your jackpots. Be sure to meet up with the Jackpot Factory manager. He’s wearing a golden hat and will payout up to 1500 times your line bet if you can spin two to five of him across an active payline. You’ll also want to spin in the lab technician. This knowledgeable lady will bring in up to 750 times your line bet. There are plenty of other symbols to help you out in your quest, including workers, robots, hard hats, golden toed boots, and gloves. There are a few symbols that are particularly important as you walk the floor of this factory. First, spin in the scatter golden pot. This pot full of coins will multiply your total bet to bring in some pretty substantial wins. You’ll also want to look out for the power switch. This bonus symbol will award you up to ten free spins with a multiplier. 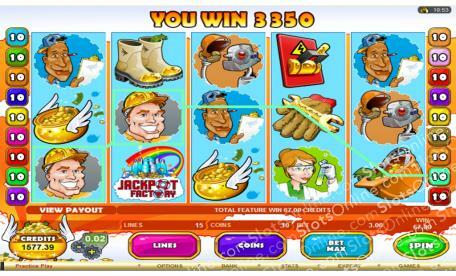 Work the line in the Jackpot Factory for a chance to create plenty of big wins! The golden pot is a scatter. It will multiply your total bet. If you can spin three to five of them anywhere on the board you will multiply your total bet 3, 12, or 75 respectively. The Jackpot Factory logo is a wild. It will replace all other symbols (excludes bonuses and scatters) to help you create more winning combinations. It also has a top payout of 4000 times your line bet. If you spin three or more on any active payline, you will trigger a free spin bonus feature. Wins are multiplied by five.